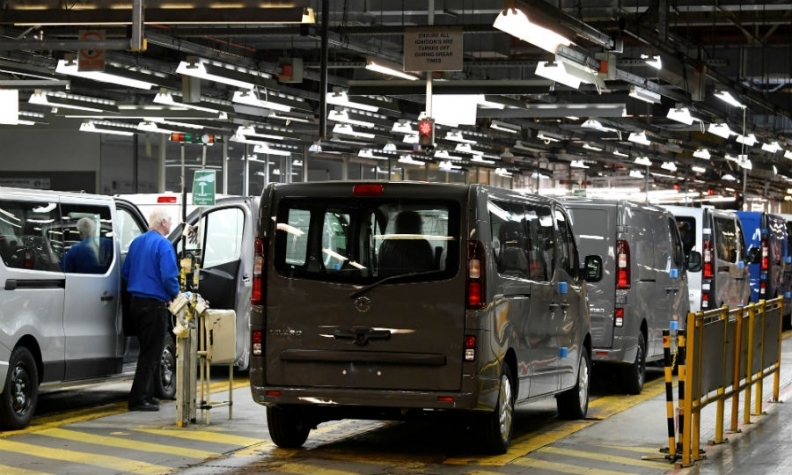 Vivaro production at Vauxhall's plant in Luton, England. LUTON -- PSA Group will boost output at Vauxhall's van plant in Luton, England, by adding Peugeot and Citroen models. Vauxhall said the next-generation Vauxhall/Opel Vivaro van will use PSA's new EMP2 platform. This will allow the factory to also build Peugeot's Expert van and Citroen Jumpy vans. Annual production will rise to 100,000 vans in 2019, an increase of around two thirds from production of 60,000 last year. The current Vivaro shares its underpinnings with the Renault Trafic, which was built at the Luton plant in the past. The Vauxhall-Renault tie-up ends next year when the current Vivaro is replaced. The British government is contributing 9 million pounds to the van investment as part of its push to support the UK automotive industry, which employs over 800,000 people and generates revenue of 77.5 billion pounds ($110 billion). Automakers are worried that any tariffs or barriers to trade imposed as part of a new trading arrangement between Britain and the EU to be agreed this year for implementation from 2021 could raise costs and make some plants unviable. PSA CEO Carlos Tavares said the decision to build Peugeot and Citroen vans at Luton was made despite Brexit. "Brexit remains a concern for the business. We welcome the recent agreement on the transition arrangement, but there is still work to do to ensure frictionless trade," he said. "Among all the uncertainties we are facing right now, Brexit isn't the strongest." PSA said the Luton plant will build vans in addition to its existing plant in Hordain, France. The company said it intends to strengthen its share of van sales in Europe and accelerate sales in the other regions. PSA said it had record light commercial vehicle sales of 476,500 last year, up 15 percent. Including passenger car derivatives, its van sales were 658,000 units in 2017, the automaker said. PSA said it had time to wait for the outcome of Brexit talks later this year before committing new money at its Ellesmere Port car plant in northwest England, where the run of its current Astra model is not due to end until the next decade. PSA, which last year acquired Opel/Vauxhall from General Motors, is cutting a third of Ellesmere Port's workforce, sparking fears over the site's future following Brexit. After rescuing PSA from near-bankruptcy in 2013, Tavares is negotiating new union deals for Opel/Vauxhall as he pursues an ambitious restructuring plan designed to restore the division's profitability by 2020. Opel/Vauxhall CEO Michael Lohscheller said the UK investment safeguards the Luton plant's future for "many years to come." Lohscheller underlined that new deals had now been struck with workers in Britain, Spain, Austria, Hungary and Poland, allowing investment in their sites. His comments raise the pressure on Germany's IG Metall union, which is in the midst of tough negotiations with PSA in Germany to cut jobs and reduce work hours after almost two decades of losses. In its statement, PSA praised the "responsible social dialogue" with the UK's Unite union guaranteeing production flexibility, and also the support of the UK and local governments.